Year in Year out Royal Ascot brings people in from far and wide for the world’s greatest race meeting. 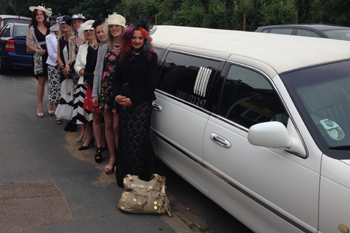 From the very beginning when we started our limo service 10 years ago 24-7 Limos have been supplying our customers with a first class limousine hire service to make Royal Ascot a truly memorable day. We can tailor our limo service for any sporting event you wish to attend. This year we are hosting the Rugby World Cup here in the UK and the tennis at Wimbledon is always a popular venue to take our Limousines to in the summer time. We often take guests to football matches and our football limo service is always a winner for the FA Cup Final at Wembley. Your limo hire comes with ice & glassware for your use for the day. We provide tables, chairs and a gazebo for your use while you’re at Ascot. Your chauffeur will more than happily help you with your every need. We will even supply you with a couple of bottles of complimentary bubbly to get the party started. The price is fully inclusive and booking early is advised as we do get booked up very quickly. Parking is limited and on a first come first serve basis, therefore booking early is recommended for the most popular race meeting of the year. Of course, we don’t just supply stretch limousines for Royal Ascot, we can use the above packages for any Horse Racing day out. So if you’re looking for transport to Sandown Park, Epsom Downs, Cheltenham Racecourse or even Glorious Goodwood then please do not hesitate to get in contact an see what great deal we can do for you. No matter what the sporting event is, we can get you there and back in luxury and style. To find out more call us for free on 0800 1123 247 or click here to get a quote.